BAKERSFIELD, CALIFORNIA (April 6, 2018) – The eighth running of the Racing for Wishes at Bakersfield Speedway will be on September 15th, and feature a new headline division in 2018. American Stocks have been boosted to the top billing with a fantastic $1000 to win purse joined by each of the Mini Dwarf divisions racing for $250 to win. Western RaceSaver Sprints, Mod Lites, and Mini Mods will also be in action. The American Stock event is expected to be one of the largest in California, offering $500 for second and $250 for third as well. The regular Bakersfield Speedway purse will apply for the remaining payout. Mini Dwarfs in both the Jr. and Sr. divisions will see $100 for second and $50 for third. 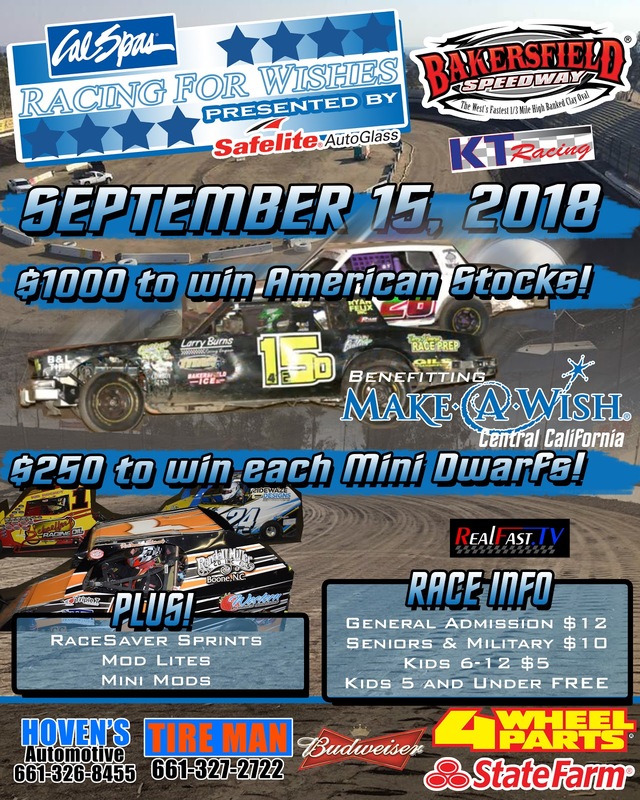 The young Mini Dwarf drivers have been a major help in the fundraising efforts throughout the years at Racing for Wishes and will get a thank you in the form of the increased payout. Great payouts are just a small portion of what makes Racing for Wishes special. Promoter Jeff Thielscher organizes many different giveaways and attractions to raise money for Make A Wish Central California. Pass the helmet, a silent auction, and sponsorships aide in the fundraising efforts. 100% of the monies donated go towards granting wishes of children in Kern County. CalSpas is the title sponsor of Racing for Wishes VIII with Safelite Auto Glass the presenting the sponsor. Hoven’s Automotive, Tire Man, 4 Wheel Parts, State Farm, KT Racing, and RealFast.TV are also presenting the event. Make-A-Wish Central California grants the wishes of children with life-threatening medical conditions to enrich the human experience with hope, strength, and joy. The chapter has granted over 2,000 wishes since its inception in 1986. CalSpas and has been a long time supporter of racing on the West Coast. CalSpas previously was a supporter of motorcycle racing at the famed Mesa Marin Raceway and has supported many stock car drivers from the region as well. Safelite increased its racing involvement in 2016 as a sponsor of a NASCAR Truck Series entry and are branching out into the grassroots of the sport. They offer windshield repair and replacement services. Now Hiring for 2018 Season. The Bakersfield Speedway is looking for a few good people to join our team for the 2018 race season. If you or someone you know are interested, we will be holding open interviews Saturday February 17th 10am to 1pm.